Ok, so I’m sure you heard the buzz. Netflix has this wild new Zombie show that’s supposed to engulf the lives of all Game of Thrones and former Walking Dead fans. Well, I gotta say that the streets got it right this time. This show has the makings to be one of those Netflix phenomenons and a show that really shifts the direction of the genre. 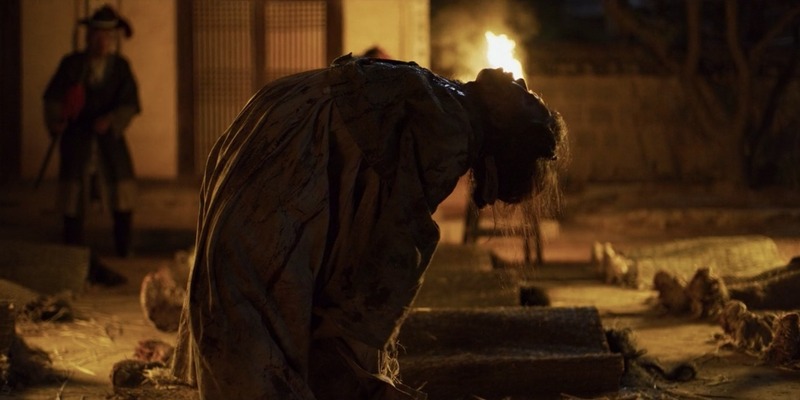 I don’t think it’ll reach Birdbox levels of memes, gifs, and infamy, but it surely has the makings to be “that dam Korean Zombie show everybody is talking about” this weekend. Here’s the thing, zombies are the last thing on your mind while Kingdom gains its footing. That’s right. The show is set during the Joseon dynasty’s lengthy 500-year reign in the Korean Kingdom and takes it time building up to the flesh eating creatures. The creators do a superb job of leaning on the political strife of the crown prince, his newish mother (and unborn baby brother), the Queens powerful family, and the king who may or may not be dead, may or may not have come down with Smallpox, and very possibly is a reanimated zombie running around the King’s palace munching on fingers and faces. History buffs, doomsday preppers, and zombie show/movie fans will all come together to enjoy this insanity in the Far East. It’s an exciting horror show that paces itself wonderfully and sets up the plague zombie outbreak beautifully. All major players receive proper introductions, and characters are given detailed backstories that explain their motivations, affiliations, and/or political ambitions. On top of all that, this is a wildly accurate period piece that spares no expense to get the setting right, and it shows significantly. Netflix brought together two of the premier creative minds in Korea – film director Kim Seong-hun and television writer Kim Eun-hee, and they’ve struck gold in an authentic way. Kingdom is filmed in Korea, used amazing Korean actors, and got the inspiration for this genre blending show from an actual 19th century record of a mysterious plague that started in the west then decimated tens of thousands as it spread to Hanyang, or present-day Seoul. With each episode coming in at a reported $1.7 million, it shows in the gorgeous scenery. Palaces are extravagant, homes are sleek, villages rustic, and fashion designs are breathtaking. I had a particular affinity for the hat game, which was beyond belief, but you gotta see it to believe it. If you’ve made it here, it goes without saying that you should definitely get down with Kingdom ASAP. Whether you’re into zombies, suspense, history, or simply need another Netflix show to get you through the week, you will not be disappointed after binging this one. You might even forget about a certain AMC show that simply did not deliver down the stretch. Did I mention that season 2 has already been confirmed? Yeahhhh, you should probably put Kingdom on like right now, and let us know what you think on Facebook and Twitter!